You can make your own tour in North Korea - choose your own schedule, itinerary and places you would like to visit! 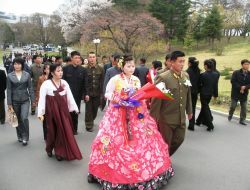 We would be delighted to help you arrange tailor-made journey in the DPRK. Please take a look at our DPRK tourist guide here >> to see what you can do in the country. Individual travelers will be prodvided with an individual transportation (a sedan instead of a bus), they will enjoy more freedom in choosing their own meals, and have more time and flexibility visiting various places. Comparing to the group tours individual tours are more expensive, so if you are looking for a cost-saving option, please have a look at our group tours. Even when only one person travels in the DPRK there will be two compulsory guides from the Korean hosting travel company accompanying a tourist at all times. Please note that even though it is an individual tour you cannot visit on your own places outside your hotel without your Korean guides. Please note that your itinerary in the DPRK should be agreed in advance (you will discuss your program with Korea Konsult when you book your tour with us) and approved by our Korean partner. Upon arrival to North Korea any change in the itinerary is possible only if it is accepted by the hosting Korean company. Our all-inclusive packages covers every aspect of your journey starting from Beijing airport. Tickets to all museums, exhibitions, and performances included in the Itinerary. The price table below is indicative. The cost of your journey depends first of all on how many people travel with you - the more friends you travel with the less will be the price. To book your individual journey in the DPRK please click here. Please note that we will need 3-4 weeks to arrange your North Korean visa, therefore please make your booking in advance.